While Alvra hesitates, not sure whether he may interfere or not with Lilith’s test, the spider has no such doubts. The beast charges and pins the drow fighter to the floor by stabbing its steel-like claw straight through armor and leg. It drags Alvra forward, stabbing deeper and deeper. It’s a chwidencha, an aberration heavily punished by Lolth. It seemingly consists of nothing but a writhing mass of long, hairy, flexible spider legs. Each leg ends in a barbed spike. There’s not a shred of drow awareness left. Phaedra is shaken by the presence. The cleric has seen far worse and fires a crossbolt at the beast, but misses in the commotion. Her sister quickly mirrors her action and shoots one too. The beast contracts its legs and four spikes now puncture the fighter, leaving its victim heavily wounded. A large earth elemental joins the fray, summoned by Jharrath. The spider turns and focuses on this new challenge. Alvra is tossed through the air and collapses against the wall. The four steel pins embed themselves in the elemental, which strikes back. Lilith rushes over to her brother and tends to his wounds. Her healing spells pull the drow back from the brink of death, and after taking an additional potion he feels somewhat better. When Alvra slowly gets up, his injured leg gives way. Again he tries, and this time he manages to stay upright. Meanwhile the scout takes out her spiked chain. The earth elemental pummels its attacker, but doesn’t do much damage. A Kellgore’s firebolt slams into the chwidencha, turning the scales a bit. Focusing her deity’s power, Lilith sends a beam of searing light into the creature. The burst of the firebolt causes the spider to turn around and see what causes the sudden pain. It lashes out at the wizard, who is struck in the side, and grapples its way deeper. Jharrath is pinned down. Phaedra, whose weapon can reach far, sees a weak spot in the middle of the chwindencha and expertly hits the beast. 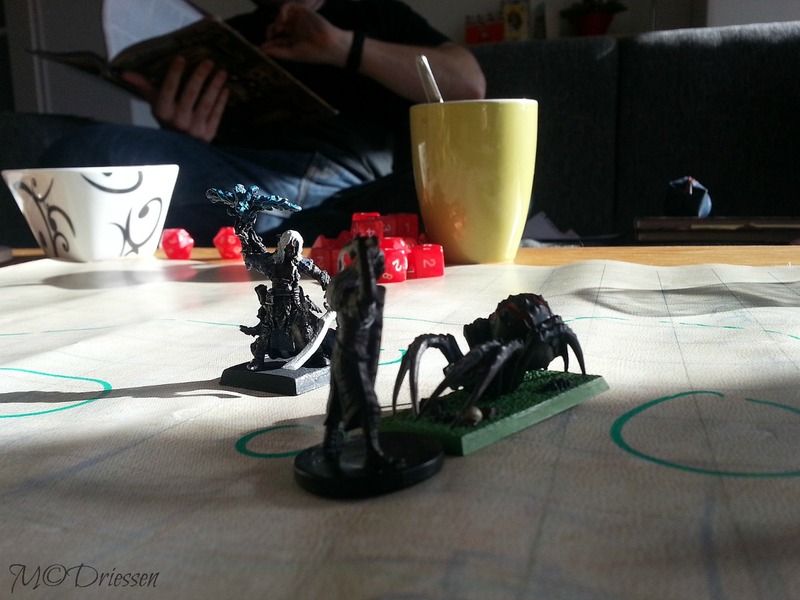 Taking advantage of the diversion, the drow wizard uses his magic boots to teleport; he appears twenty feet away. He looks awful. After a punch by the earth elemental, the spider doesn’t look too good either. Alvra’s attempt at attacking fails, his javelin lands among the discarded bones of the former opponents of the aberration. The cleric’s crossbow bolt also flies wide. The fight between spider and elemental continues, until rays of scorching fire score direct hits. Jharrath kills the beast with two blasts from his wand and earns himself a healing from his mistress.